Antique furniture, western and native artifacts, original oil-paintings and sculptures accent the authentic log-lodge feel of this alpine inn and retreat center. A distinctive German U-boat spotting scope allows ‘those who prefer to watch’ to follow the progress of the more gung-ho in their party canoeing or ascending Whitehouse or other mountain trails above their reflection in Beaver Lake. More literary escapists may browse and sample our extensive ‘philosophical’ library that ambles from Schopenhauer to Charles Schultz. Many minor amenities range from fax machine, and email to player piano and campfire circle. Groups and other guests love the freedom to arrange the use of the following major common areas to suit their own needs. 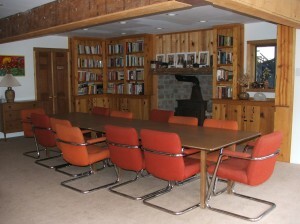 The 35×26 Main Meeting Room opens onto the 40×26 Main Deck and includes the coffee bar, the slide and film projection “booth” and screen, and the library. 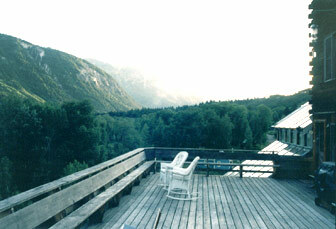 There is a range of set-up options to please anyone from carpet-dwelling yogi types to boardroom meeting types. For breakout rooms, small groups can gather in the great room, dining room, greenhouse, on decks (seasonally), or even in the glass and timber hot tub/body work room. The Great Room offers any guest the informal nesting comfort of couches surrounding the 20 foot moss rock fireplace which has heard the tales of many artists, writers, gurus and adventure travelers … and is still listening. Soft light and music on the log walls lined with buffalo robes, moose antlers and other gifts from time spent with primal cultures, make this place to congregate before and after dinner … or any time crackling firelight is desired. The “Canoe” Dinning Room seats 16 in its usual family style arrangement but can be set up for five separate couples’ tables when desired, without altering the stimulating views of Beaver Lake, Whitehouse Mountain, The Great Room fireplace or the handmade 1961 Old Town Guide overhead. Guests have been heard saying, “Canoe” please pass the salt? The Kitchen, as it should, warms the soul as well as the meals and snacks you may arrange for under several food plan options, ranging from the casual B&ampB Breakfast to the more involved catered or group-prepared feasts of your own design and dietary preference. Call for details of different food plans and the dining-out options. 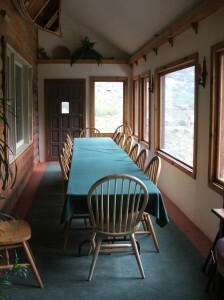 The Main Deck can serve as a break space or as a sunny activity space for program groups like tai chi or landscape painting classes. It is a place to grab a deck chair, and maybe a blankie and a drink while gazing at a sunset .. or on the darkest nights .. more stars than you ever thought visible. 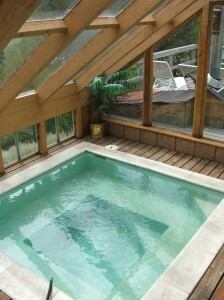 The huge hot tub enclosed by timber and glass with winter guests in mind, has held up to 25 very friendly friends, plus one lobster … but is more often enjoyed by one or two at any hour or season. A smaller outdoor deck offers private sunning or a spot for courageous winter hot tubbers to close their pores with snow angels …Scandinavian style. At 8000 feet, surrounded by regal mountain peaks, you overlook the placid waters of Beaver Lake and the shimmering Crystal River from this south-facing mountainside into one of Colorado’s most verdant valleys … reputedly the best view in Marble. Trails for all seasons and reasons abound and many begin at the retreat with no need to even acknowledge your car until you force yourself to depart. From the easy strolls along tree-lined streams leading to waterfalls, to the more challenging game paths through tundra meadows and the trail heads to Aspen and Crested Butte, we can direct or jeep-ride you to splendid day trips or even overnight outings to our private wilderness in holdings. 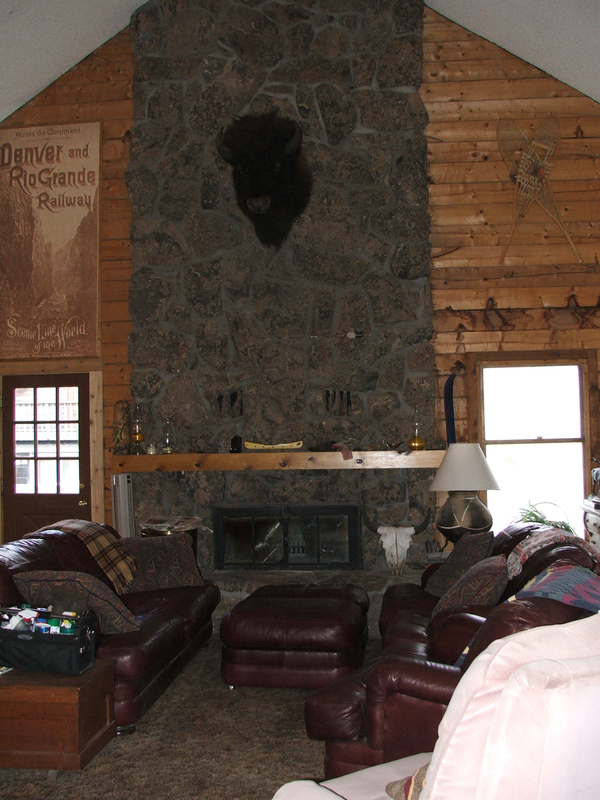 You may arrange for the use of our canoes, mountain-bikes, snowshoes or ice-skates or bring your own back country skis or kayaks. But there is absolutely no shame in feeling beckoned to just relax, feel the mountain air or get lost in the scenery … a book … or your dreams.